It’s that time of year when road verges, commons and any other piece of public land local councils can decorate are yellow and flamboyant with frilly daffodils. I love them. Not only do they remind me of Wordsworth (always a nice remind), but they make a raucous statement that spring is here and all things are new. Beside the daffs the quiet, modest flowers, are also doing their job making parks and gardens beautiful – winter aconites, primroses, snowdrops and grape hyacinths (Muscari) and others. Poetry is the synthesis between hyacinths & biscuits. Everything in the world has someone to write about it. Thank you for visiting my blog and commenting. I’m so glad you like it. You shared the beauty in the world. Love the story. I’m going to read it later and take my time. 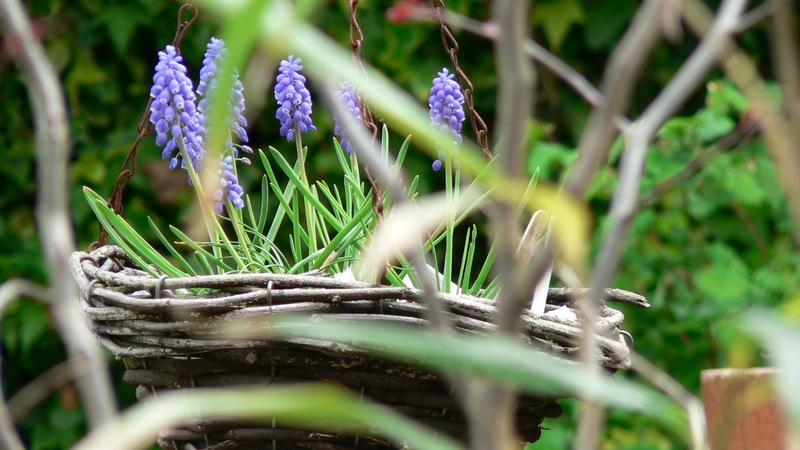 I love your happy intro on Spring…all things are new, and the quote by Carl Sandburg- Poetry is the synthesis between hyacinths and biscuits. Enjoy your spring in Holland, don’t forget to post those lovely tulips in bloom! Thank you for your comment and good wishes. If any of the photos of Holland turn out OK I’ll post them. We have our yearly tulip and daffodil festival coming up in Washinton State near Seattle in April and it has been called little Holland endless fields of color. It sounds lovely. I hope the weather is good for it. Will you be going to see it? I’m hoping to go to Holland for the tulips later this month. I’ve never been and I think it’s one of my few ‘must see’ sights. Thank you for the comment. Yes I go every year and the shops in La Coner,Washigton,a tiny town right near the flower fields, are covered with flowers and the one main street teaming with tourist. We are in Salmon country and one of the sea food restaurant has a sidewalk grill set up that is about 20 ft long and they are BBQing salmon and the smell is captivating. You can buy salmon and chips from the grill master and it is absolutly wonderful. Have fun in Holland ..send pictures. Link to our dafodil festival in Washington State near Seattle about 50 miles from where I live. Also shown are world wide Spring flowers and maybe your Holland fields are shown. Thank you for the link. It doesn’t seem to include Holland but does travel far and wide. Daffs are obviously an international favourite.